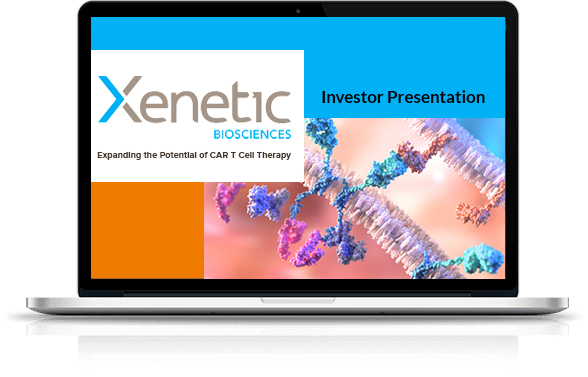 Xenetic Biosciences is a biopharmaceutical company focused on the acquisition, research and development of novel oncology therapeutics, including next-generation cellular immunotherapies for difficult to treat cancers, including B-cell Lymphomas, as well as improved biologic drugs. The Company recently announced its plans to acquire the XCART platform, a novel CAR T technology engineered to target patient- and tumor- specific neoantigens. The acquisition is subject to conditions typical for a transaction of this kind, including appropriate stockholder approvals, and is expected to close in the first half of 2019. The Company plans to initially apply the XCART technology to develop cell-based therapeutics for the treatment of B-cell Lymphomas. We believe our personalized T cell therapies have the potential to offer cancer patients substantial benefits over the existing standard of care and currently approved CAR T therapies. Xenetic's Phase 2 oncology asset, XBIO-101 (sodium cridanimod), is a small-molecule investigational immunomodulator and interferon inducer which, in exploratory clinical studies, has also been shown to increase progesterone receptor (PrR) and estrogen receptor (ER) expression in certain tumor tissues. The Company plans to pursue collaborations with immuno-oncology (I-O) companies in which it would seek to use XBIO-101 in combination with approved or developmental I-O compounds such as checkpoint inhibitors. Additionally, Xenetic's proprietary drug development platform, PolyXen™, enables next-generation biologic drugs by improving their half-life and other pharmacological properties. The Company has ongoing business development activities to explore partnerships utilizing its PolyXen delivery platform.